This week, a full set of 1500hp on-shore oil and gas drilling rig mud system will be ready and dispatch to the clients. It is a standard oil and gas drilling mud cleaning system composed of 4-stage solids control equipment as well as the degassers. 1) 1 ea mud gas separator (poor boy degasser) before the mud system. It is used to cut the intrusive gas in the mud before shale shaker. 2) The 1500hp mud system is composed of 3 ea linear motion shale shaker for pre-separation. It is the first stage separation. 3) After the 3 shale shakers, there is a vacuum degasser used to cut the fine gas bubble and protection the hydro cyclone separators. As the hydro cycone is a kind of pressure device. The gas bubble may make damage to the cones. 4) A separate set desander mud cleaner and a desilter mud cleaner is followed after the degasser. They work for the second and third stage separation. After desilter separator, most particles above 27 microns will be removed. 5) As the desander, desilter can only remove particles bigger than 27 microns. The smaller size is out of its working range. After some circulation, the fine solids contents will be higher and higher. The drilling mud will be too weight for drilling activities. 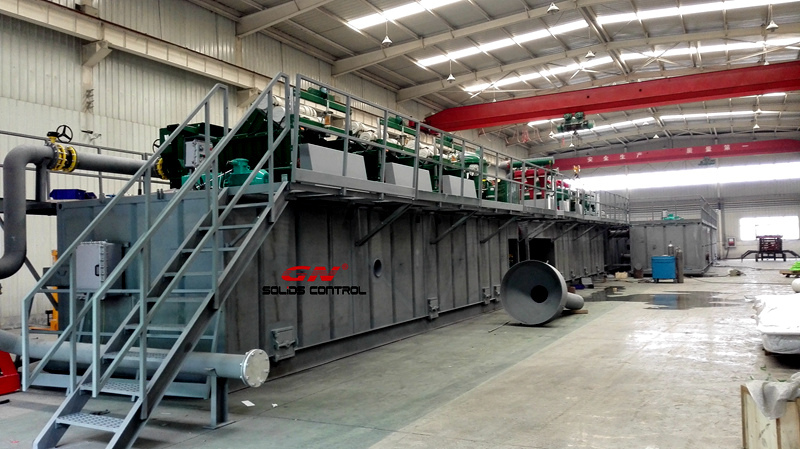 A big bowl decanter centrifuge model GNLW452 is equipped after desilter to recovery the valuable barite and reduce the mud weight. 6) Over 30 sets mud agitator and mud guns are equipped with the mud system for better mixing and to avoid the mud settle down. 7) Furthermore, the 1500hp mud system is with a jet mud mixing system to prepare new drilling mud. The whole 1500hp mud cleaning system is divided into 3 parts – mud recycling tank, mud mixing and storage tank, water and fuel tank.